I wondered what the Victor Talking Machine might be. I found an add on another page for J.I. Silva’s store. 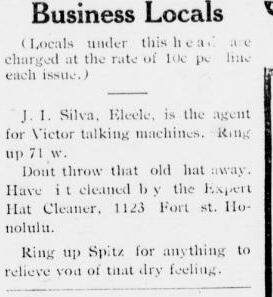 It advertises the Victor Talking Machine, but doesn’t say much about them. They cost $10 are up, which must have been big money for people making $10 or so a week. 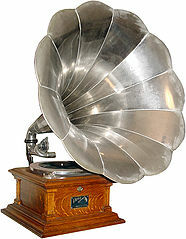 I did a little research on the web and found out that the Victor Talking Machine was a phonograph. 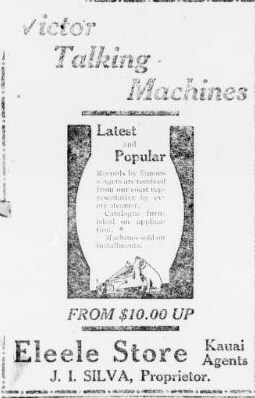 They Victor Talking Machine Company was founded in the US in 1901. The company was defunct in 1929. However, that wasn’t the end of it. You might know this company better by the name RCA Victor. According to Wikipedia, The Victor Talking Machine company made it’s own recordings. They had an in house orchestra that made the music for their records. I wonder how many of these J.I. Silva sold? There were some wealthy families on the island, so maybe he did good business.